When looking for a wiring diagram for a light switch, you first need to ask yourself what kind of a light switch you are working with. In most home wiring situations, you will likely only find three types of light switches. The most common light switch is the single pole light switch. The 1-pole light switch will have two terminals on it, and possibly a third terminal that is a ground connection. If you only have one cable in the device box, then the switch outlet is likely wired as a switch leg drop. You should only have two wires connected to the main switch terminals; one being a white wire identified by black tape or marked with a black felt pen to one terminal, and one black wire connected to the other terminal. It doesn’t matter what terminal the wires are connected to on a single pole switch. The bare ground wire should be connected to the grounding terminal if there is one present. The device or outlet box must be connected to the ground wire if it is a metal box and to a plastic device box if there is a ground screw and grounding strap as an integral part of the box. If there are two or more cables in the outlet box, the main switch terminals will likely have a black wire on each terminal, or possibly a black wire on one and a red wire on the other terminal. Here is a wiring diagram for a switch (single pole). Another type of switch you will encounter within the home is a three way switch. The 3-way switch may have a grounding terminal, and the box and the switch should be connected to the ground wire as described above. The three way switch will have three terminals on it; two on one side, and one terminal on the other. On the side with two terminals, one will be identified as the common terminal and will be a different color than the other two (brass), and most likely will be black. The only one of the three wires to keep track of and identify if replacing a three way switch is the wire connected to the common terminal. Here is a wiring diagram for a light switch (three way light switch). The third type of switch you may encounter in the home is the four way switch. The 4 way switch has four terminals. Grounding is required as described above, and the four terminals will be identified in pairs as the “in” terminals, and the “out” terminals. If replacing a four way switch, you must identify the pair of wires that are connected to the “in” and the pair of wires connected to the “out” terminals. Here is a wiring diagram for a light switch (four way light switch). It is possible that you may encounter a double pole light switch within the home, but these are not very common in a residential setting. These switches have four terminals as well, but the terminals are identified as “line” and “load”. The double pole or 2-pole switch is essentially two single pole switches operated by one toggle. Each side is an independent light switch. 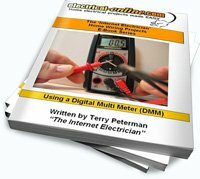 Armed with this information you should now be able to clearly identify the type of switch you are working with, and the wiring diagram that will help you complete your home wiring project. This entry was posted in Electrical Wiring, Switches and tagged 1-pole switch, 3-way switch, 4-way switch, double pole switch, four way switch, grounding, light switch, single pole switch, terminals, three way switch, wiring diagram. Bookmark the permalink.